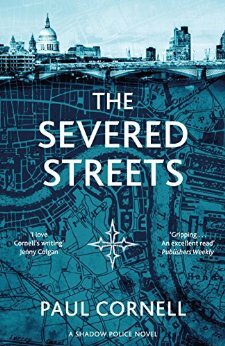 The Severed Streets is Paul Cornell's second Shadow Police novel, his urban fantasy series about a small team of London police who've been gifted/cursed with a form of second sight that only works within the boundaries of London (or, it turns out, selected other cities around the world.) This installment has a backdrop of political unrest and riots, as a supernatural figure that seems to be emulating Jack the Ripper starts to wreak havoc, but twisting the Ripper's MO to actually only kill men. It's strong but very dark, which may be one reason it took me a while to get through - the political metaphor is clear and this is a very angry book that takes a lot of frustration out on its characters. Its bleak nature made it hard to pick up sometimes, especially when reading it at a time when the situation is even worse than the one a couple of years ago that Cornell is railing against. The other very contentious issue with this particular book is a little in-joke that goes way too far. In a novel where a number of characters have very obvious real-life counterparts, it's a good gag to have a knowing reference to a famous fantasy author being part of London's supernatural subculture, and then turn round at the end of the paragraph and state outright that it's Neil Gaiman. To then have that cameo expand and just keep on getting bigger until Gaiman ends up having massive plot significance just feels really indulgent. So it's a shame the one touch of levity is a smug one that takes you out of the story, but it's an interesting enough world that I probably won't be giving up on it just yet, although I hope the next book in the series features a bit more actual escapism in its fantasy.